Spending so much time in North America is forcing me to learn new words like Diaper, Vacation, and Soccer, in order to be understood. The upside is the opportunity to learn about new wines, often unavailable in the UK. Take this Merlot from British Columbia for example. 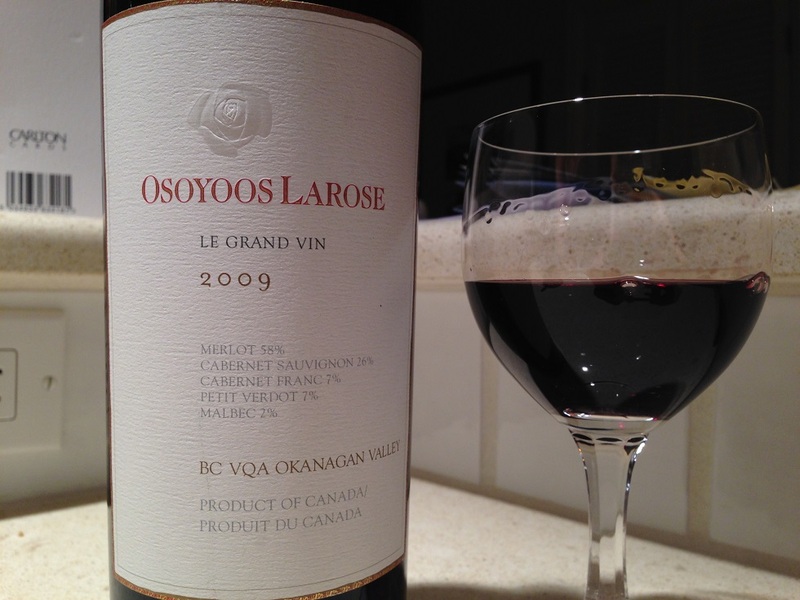 Following the path trodden by many South American wineries of recruiting a little friendly advice from the old world, this Osoyoos was made with consultation (and, no doubt, a financial interest) from the owners of Saint-Julian stalwart, Gruaud-Larose. And it shows. To me it was indistinguishable from a Bordeaux, probably right bank. Fruity, deep and lovable and not at all chewy. I wonder if they’ll export it any time soon. If not, you can copy me and buy it from SAQ in Tremblant Resort for CAN$44.50, which equates to about US$39, or £24. That sounds expensive but Canadian sales taxes are fierce and this price even includes a 3% “resort association levy”. NYC taxes are more reasonable. I never thought I’d say that about anywhere. This entry was posted on Thursday, February 6th, 2014 at 9:48 pm	and is filed under canada. You can follow any responses to this entry through the RSS 2.0 feed. You can leave a response, or trackback from your own site. We stayed in Osoyoos for a week+ in 2011 visiting local wineries but I didn’t encounter this wine. It’s a lovely place with interesting geology and we were sad to go. Excellent wines are made in Okanagen Valley. ANd those Canadian liquor taxes vary province to province. I recently got a nasty surprise in bringing wine into British Columbia and found out the hard way at the border that there is an 85% liquor tax (+12% sales tax). Protectionist bureacracy at its best.